When Anthony Raso opened his new Toronto-based garage at the beginning of last winter, he leaned on Groupon’s reach to advertise his business – and he was having trouble keeping up with the bookings. Starting as a one-man operation, Raso’s Executive Car Care sold a rustproofing special on the daily deals site for $59, on what would normally be a $120 package. He sold just less than 200 of the deals and immediately started fielding calls to book in his new customers – using a paper and pencil system. “If I was on the road, I had a different book in my car, then I’d have to make sure that book matched the one in my office,” Raso says. With about 15 to 20 bookings a day for his fledgling new auto shop, the mechanic knew he’d need a more sophisticated system – he considered buying an iPhone to use as a calendar that would sync with his Mac in the office. OpenCal is now Groupon Scheduler. Groupon was calling to tell Raso he could now use its free Scheduler tool. 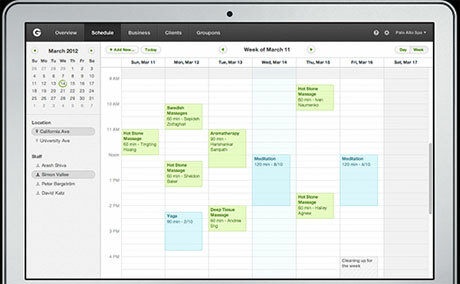 It’s a Web-based calendar that the largest business in the daily deals space acquired with Vancouver-based OpenCal in Sept. 2011. Now, Groupon has opened up the tool for all businesses to use for free, whether they are a Groupon customer or not. It’s giving Groupon a differentiator from the other daily deals sites that have quickly popped up to compete in the hot market. For small businesses that aren’t using Groupon and are appointment based, it offers a convenient and reliable Web-based booking tool. For businesses that rely on Groupon as part of their marketing strategy like Raso, it’s even more than that. OpenCal’s tool was reborn in the guise of Groupon Scheduler in December and was pilot tested in Miami and Sacramento for merchants already running Groupon deals. For Groupon buyers, the new tool is made apparent by the “Book Now!” button. If a merchant is appointment-based (like a car tune-up garage for example) and uses Scheduler, the buyer can book their appointment directly from Groupon.com after they make their purchase. A merchant can also place the “Book Now!” button on its own Web site, for customers who aren’t buying Groupon deals. The calendar offers merchants the advantage of a unified calendar system that can be updated from any Web browser. It also decreases customer no-shows by e-mailing them the date and time of the booking once they’ve made it, and a reminder 72 hours before the appointment. Merchants are also being creative about the way they use Scheduler, Katz says. Raso is running four different calendars with the tool for his garage. One is dedicated to his Groupon customers, another is for his window tinting service, another for rustproofing, and one to schedule shifts for his new employees. Raso has hired eight workers over the past few weeks to help keep up with the demand from his Groupon customers. Groupon is aimed at helping local businesses that typically have little or no online presence promote their business on the Web , says Albert Bitton, principal analyst at Group Buying Canada. Now it could offer even more offline businesses a way to sell their goods directly over the Web. For the OpenCal team acquired by Groupon, a blog post from last December celebrates the change. While new signups for OpenCal aren’t being taken, existing users are still able to use the tool. “We’re excited by this opportunity to bring our online appointment and booking platform to a broad set of merchants and consumers world-wide,” the blog says. Groupon has plans to roll out the tool across North America and internationally in the future.